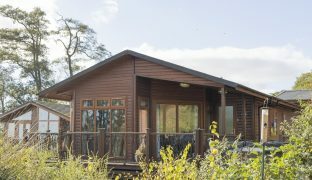 A versatile holiday home, new in 2011, set in a tranquil 5 star multi award winning holiday park and marina. Rented moorings are available. 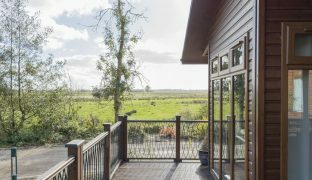 The lodge has contemporary styling, with vaulted ceilings and an integral corner verandah, ideal for al fresco dining against a truly stunning location, and includes a hot tub run from the central heating boiler for maximum efficiency. The lodge measures 40ft x 20ft, with two bedrooms, sealed unit double glazing and LPG central heating, plus an integral covered verandah and 6ft balcony. The master bedroom has a walk-in wardrobe with en-suite shower room, and the second bedroom has a separate family bathroom. The lodge is available fully furnished, and includes ramp, carpets, furnishings, fully fitted kitchen and bathrooms, TV and DVD player, light fittings, crockery, cutlery and utensils. The park is a haven for walkers, photographers and anglers alike, and has been awarded the David Bellamy Gold Conservation Award for the last 9 years, as well as Trip Advisor Certificate of Excellence, reflecting the site’s achievements in both conservation efforts and customer service. Lodges are offered on a 40 year licence at an initial ground rent of £4,150, reviewed annually.